This piece about Shimon Peres made me shed many tears – what a historic and beautiful figure. At a farewell dinner for Israeli President Shimon Peres in Washington on Wednesday night, several of the American guests appeared to approach him with tears in their eyes. This emotional display was a sign of Peres’s personal impact on the U.S.-Israel relationship and the way his departure marks the passing of an era. Peres, at 90, is the last iconic figure of Israel’s founding generation. All the powerful elements of Israel’s creation are part of his life story: He emigrated from Poland in 1934; his family members who remained behind were killed during the Holocaust, many burned alive in their local synagogue. He worked on a kibbutz as a dairy farmer and shepherd, and at the age of 24 he became a personal aide to Israel’s founding leader, David Ben-Gurion. “Little did he know it at the time, but milking cows and herding sheep prepared him well for a long career in Israeli politics,” Israeli Ambassador Ron Dermer told the gathering at the Israeli Embassy. Dermer cited the astonishing statistic that Peres has been a public servant in Israel for nearly 67 years, including two stints as prime minister. What has marked Peres throughout his career has been a liberal optimism about Israel and its place in the world. The years of war and terrorism made many Israelis darkly cynical about their state’s survival and the measures necessary to preserve it. A cult of toughness developed among Israel’s political elite, which has taken full flower in Prime Minister Benjamin Netanyahu and his coalition partners. But Peres remained outside the tough-guy circle. He spoke openly, perpetually, about his yearning for peace. Peres’s gentle demeanor contrasted with the implacable, bulldozer style of other members of the founding generation, from Yitzhak Rabin and Golda Meir to Ariel Sharon and Menachem Begin. Peres sometimes seemed the bridesmaid at the Israeli political wedding, never quite achieving the status of some of his contemporaries. But he outlasted them all, and as Americans began to wonder during the Netanyahu years whether Israel was really committed to a two-state solution to the Palestinian problem, Peres was a reassuring affirmation. The optimistic side of Peres’s character was captured by Susan Rice, the U.S. national security adviser, in moving remarks. After saying that Peres had often reached out personally when she had a “rough patch” the past few years, she quoted her favorite Peres-ism: “There are no hopeless situations, only hopeless people.” In another man, this sunny sentiment might seem soft. 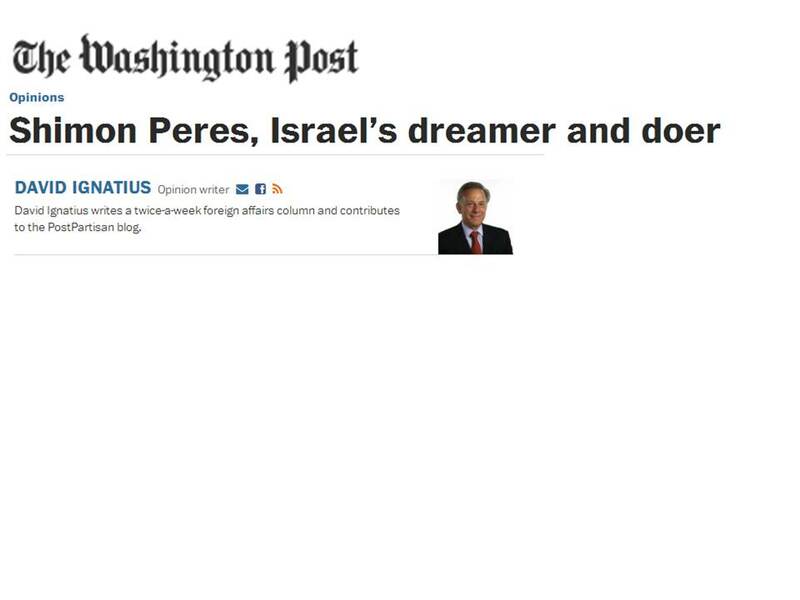 Not so with Peres. His was an earned optimism. The United States didn’t have to befriend the small, embattled country of Israel, but it chose to do so because of its generosity, Peres said. He talked, in a veiled way, about his farewell with President Obama that day. Peres’s message, as best I understood, was that Obama should be faithful to who he is and not try to conform to demands about what he ought to be. Perhaps that’s the kind of advice that can be dispensed only by the world’s oldest living president. The guests Wednesday night were testimony to the political power of the U.S.- Israeli relationship. There were several dozen members of Congress, plus Supreme Court justices, various Cabinet members and political commentators. It was a bipartisan group, which was a reminder that, however strained the relationship between Obama and Netanyahu, a core element in the relationship transcends parties and administrations. “Peres is that rare leader who is both a dreamer and a doer — talking about the future and getting things done,” said Dermer. It was very much in Peres’s style that he would strike up a personal friendship with Pope Francis and show up at the Vatican this month for a meeting with the pontiff and Palestinian President Mahmoud Abbas. Dermer joked that he was the only Israeli president who might be a candidate for sainthood. Peres’s successor as president will be Reuven Rivlin, a respected right-wing politician who opposes creation of a Palestinian state — the cause Peres championed. However well Rivlin performs, it’s unlikely Americans will approach him at the end of his career wiping away tears.